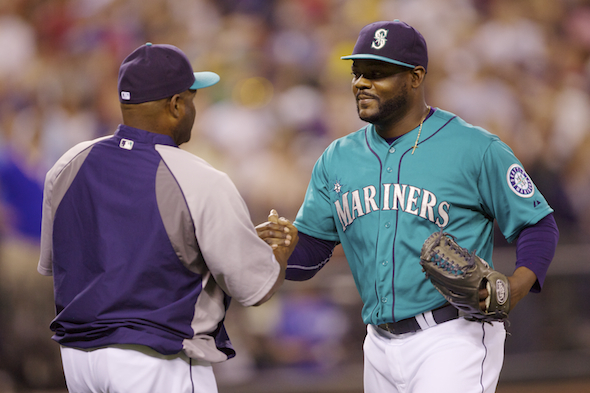 In contention for an AL wild card spot, the Mariners not only feature the best bullpen in franchise history, but one of the best in the majors over the past 25 years. The Mariners spent a major portion of the past weekend celebrating the accomplishments of Lou Piniella, making him the eighth inductee into the team’s Hall of Fame. Among Piniella’s notable deeds during his 10-year reign (1993-02): 840 victories, seven winning seasons, four postseason appearances, and numerous not-to-be forgotten ejections. It’s a record unmatched by any other manager in franchise history. Piniella’s portfolio would sport an even brighter sheen if he hadn’t been burdened by six of the 10 worst bullpens, by ERA, in club annals, starting with the 1999 edition – Jose Mesa, Jose Paniagua, Ken Cloude, Frankie Rodriguez, Eric Weaver — that blew 18 saves and finished with a 5.94 ERA, the principal reason Seattle finished 79-83 and missed the postseason. The 1998 bullpen was almost as gallingly sloppy, blowing 21 saves and ending with a 5.44 ERA in a season that saw the Mariners finish 11½ games behind Texas in the AL West. During his 10 seasons in Seattle, Piniella’s relievers combined for 188 blown saves, more than a full season’s worth. The current numbers would look even better if closer Fernando Rodney hadn’t blown a save Saturday night and followed Sunday by giving up a ninth-inning run. In addition to allowing nearly a run less per game than Piniella’s 2001 116-win phenomenon, the current pen ranks first in the American League in ERA at 2.36 and first in fewest runs allowed (100), fewest home runs allowed (20) and opponent batting average, .213 to Oakland’s .219. Except for the 2001 Kazuhiro Sasaki-led group, which allowed a .202 batting average, the closest bullpen to this one was Eric Wedge’s in 2012 at .230. Piniella managed the most generous pen at .299 in 1999. 4 RBIS BATTING #1: Austin Jackson produced four RBIs Sunday in Seattle’s 4-2 victory over the Chicago White Sox. Jackson became the second leadoff hitter in franchise history to drive in all of the Mariners’ runs in a game in which they scored at least four times, joining Tony Bernazard, who had five from the leadoff slot against the Angels in a 10-5 loss Aug. 13, 1983. Six Seattle leadoff hitters have driven in more than four runs in a game, including three who accomplished the feat twice: Mickey Brantley, Ichiro and Brad Miller. Brantley had seven RBIs Sept. 14, 1987 against Cleveland (went 5-for-6 with three home runs) and five against the White Sox June 16, 1987. Ichiro had a pair of five-RBI games, Sept. 20, 2003 vs. Oakland and Aug. 17, 2004 vs. Kansas City. Miller’s five-RBI games came July 19, 2013 vs. Houston and Sept. 28, 2013 vs. Oakland. LATE LIGHTNING: Catcher Mike Zunino, who received a day off Sunday, crashed a three-run homer Saturday night to wipe out an early White Sox lead and provide Hisashi Iwakuma with his 10th win (4-1). It was Zunino’s team-leading 18th home run, all of which have come with him batting sixth, seventh, eighth or ninth in the order. That’s the most home runs hit from that part of the lineup by any major leaguer this season. It’s also the highest total of home runs hit from that area of the lineup by a Seattle player since Jay Buhner hit 25 in 2000 while batting sixth. Two others, Jimmy Presley in 1985 and Paul Sorrento in 1997, had 21 home runs, Presley batting seventh, Sorrento sixth. And, since you’re wondering, Bob (Scrap Iron) Stinson still holds the single-season record for home runs by a No. 9 hitter, eight in 1978. Ahhh, Bob Stinson…one of my favorite early Mariners along with Bill Stein, Julio Cruz and Rooop. I remember Scrapiron staying active after his MLB days and putting a team together to play the Colorado Silver Bullets in Everett their first season in 1994(?). I talked briefly with Phil Niekro, who was managing the Silver Bullets, after the game but never thought to ask if he was teaching any of his pitchers the knuckler. There’s no reason women can’t be effective throwing them and it’s truly a Great Equalizer when it works.